The plate description is on page 2 of the work. 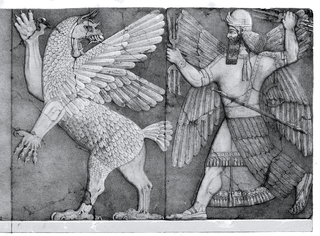 The image in the book is by Faucher-Gudin , an drawing based on the excavated Bas-Relief. The Bas-Relief was in not as good condition. About thirty feet to the right, or north, of the lion gateway was a second entrance, at each side of which were two singular figures. One was that of a monster, whose head, of fanciful and hideous form, had long pointed ears and extended jaws, armed with huge teeth. Its body was covered with feathers, its fore-feet were those of a lion, its hind legs ended in the talons of an eagle, and it had spreading wings and the tail of a bird. Behind this strange image was a winged man, whose dress consisted of an upper garment with a skirt of skin or fur, an under robe fringed with tassels, and the sacred horned hat. A long sword was suspended from his shoulders by an embossed belt; sandals, armlets, and bracelets, completed his attire. He grasped in each hand an object in the form of a double trident, resembling the thunderbolt of the Greek Jove, which he was in the attitude of hurling against the monster, who turned furiously towards him. This group appears to represent the bad spirit driven out by a good deity; a fit subject for the entrance to a temple, dedicated to the god of war. The singular combination of forms by which the Assyrian sculptor portrayed the evil principle, so prominent an element in the Chaldæan, and afterwards in the Magian, religions system, cannot fail to strike the reader. There are at least two interpretations of what the image is/was intended to represent. Some modern sources state this is probably Anzu and Ninurta. eg in Gods, Demons and Symbols of Ancient Mesopotamia: An Illustrated Dictionary? (Jeremy A. Black and Anthony Green ISBN: 978-0-292-70794-8) p.142 states as text to same image : " Ninurta or Adad pursues a leonine bird-monster, perhaps the Anzû or Asakku. " 현재 2016년 5월 21일 (토) 23:45 2,012 × 1,484 (3.52 MB) Vles1 I increased the contrast of the picture.